It's flu season. Also known as the time of year when moms are doing everything the y can think of to help a congested baby get comfortable. Have you been relying on that handy little bulb syringe to give your babe a snot-free sleep? You might want to re-think that! The latest photo to go viral on Facebook comes from a Kentucky mom who cracked open her baby's nasal aspirator. What she found inside will give moms chills. Mitzi Johnson said she always cleaned her son's nose bulb with hot soapy water after each use. But photos on her profile -- which have since been shared thousands of times -- show an open syringe chock-full of mold! Did you know exposure to mold for kids under 1 significantly hikes their risk of developing asthma? And of course if mold is growing in there, who knows what other bacteria could be building up inside one of those syringes ... and is now being shot right up into baby's delicate nasal passages? Johnson is a self-confessed "germ freak" who says she'll never use the bulb again, and she shared the photo to warn other moms who are all jumping right on board. 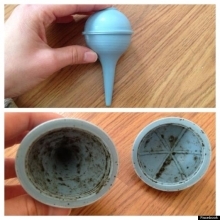 I always liked that the little blue bulb was a more holistic way of treating my daughter's stuffy nose, but one look at all that mold, and I will never, ever buy one of these for a baby shower again. But of course we're still in the midst of cold and flu season. Babies are still getting snotty noses. So what can you do to keep them comforted? Here are a few mold-free options! Have you been using the bulb syringe for your baby's nose? What will you do now?